Dutch Lap Siding is made to look like wood siding that was hand carved by old world craftsmen. It adds charm and elegance to any home. Anywhere that you need to create that classic old world look, it will add a distinctive look that makes any home stand out. Note the curve that runs along the top edge of the siding panel. This is what makes the heavy shadow line characteristic of this style of siding. Early colonist actually hand carved the grove onto each wooden board. This took extra time to hand carve and was more expensive than regular sooth lap. Today vinyl siding is made to capture that same hand carved wooden board look, at about half the price of real wood. And it never needs painting! CertainTeed Vinyl Dutch Lap Siding in Oxford Blue. 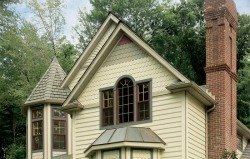 Dutch Lap version or style of Clapboard siding is where there is a decorative groove or notch that runs along the top edge of the board. This had to be hand carved in earlier times and took much more labor to do the hand carving. The extra labor required to hand cut the notch made it a more expensive siding and was used by homeowners who could afford it. It was considered to be a premium siding. It is used on all styles of homes but is especially applicable on homes with more traditional architecture. This version of Clapboard siding, sometimes called 'Lap' siding, is where there is a decorative groove or notch that runs along the top edge of the board. This had to be hand carved in earlier times and took much more labor to do the hand carving. To see more pictures of homes using vinyl Dutch Lap click here. Gives any home that extra charm. Note homeowner has used vinyl Cedar Shake siding on the top gables for accent. Using different types, colors and styles of vinyl siding to create that special look is what makes today's vinyl siding the number one selling siding in the U.S.
CertainTeed's Monogram Dutch Lap Siding in Buckskin Color. Comes in over 30 siding and trim colors. Tested to withstand wind load pressures up to 220 mph. Class 1 a fire rating. There is another clapboard style that has a shadow line. Beaded Style. It has a notch cut along the bottom edge of the board or panel. 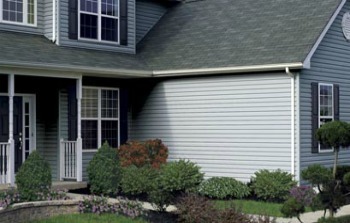 Click here to see more about Beaded Vinyl Siding. 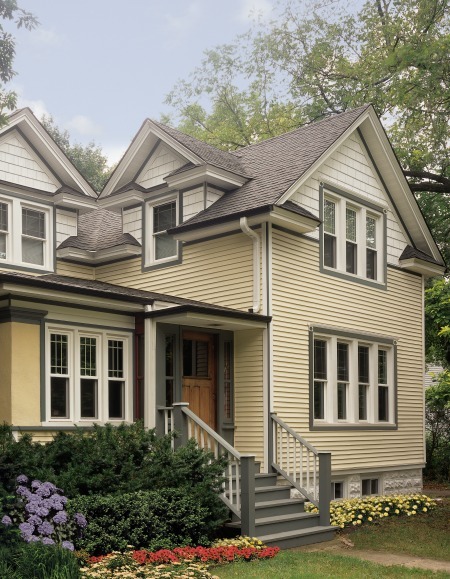 To review more vinyl siding styles click here.